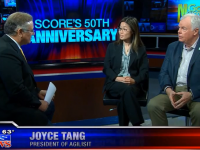 ​KUSI News anchor Carlos Amezcua interviewed AgilisIT Founder and President Joyce Tang and SCORE mentor Tom McGurn on Good Morning San Diego. Joyce discussed the challenges of building a business and the tremendous benefits of mentorship in growing AgilisIT. She attributes the success of her award-winning company to her hand-picked team of employees and outside advisors.